If you’ve never heard of finswimming, it is fast version of ordinary swimming. In finswimming athletes use monofins or bi-fins to swim distances as fast as they can. As they use fins they can swim about 30% faster than 'conventional' swimmers. Type 'finswimming' into YouTube to watch the videos and you'll see what a beautiful sport it is! Neptune Finswimming Club is just over two years old. Although it is quite difficult to develop a niche sport, we’ve managed to spread knowledge about finswimming. Currently we have 10 active members including 3 boys. Although this seems small, we are proud to be one of the biggest clubs in the UK! Our club takes part in National and International competitions. At the recent Belgium Open Finswimming Championship in Nivelles our members set a National Record and several age group records. 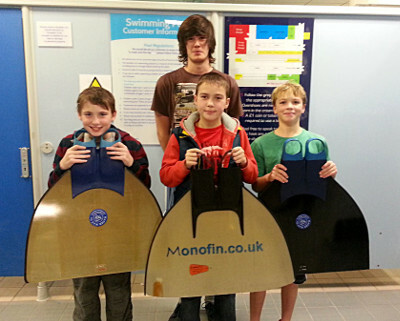 We are planning to run our own Finswimming Gala on the 7th of December in Bradley Stoke Leisure Centre. We’re expecting about 20 finswimmers from all over the country to attend this competition, whichis the first event of such level organised by our club. Before this event we’ve held regular informal time trials for our club members to monitor their progress. As a result of our activity in Bristol we’ve managed to generate a lot of interest in the sport. One thing that restricts our growth is a lack of finswimming coaches. Our plan is to invite ordinary swimming coaches experienced with working with young swimmers, train them into finswimming and with their help expand our children's group. We think that focusing on the children's group will create a long lasting legacy and support for this sport in the country. Do we think that finswimming has got a great future in the UK? Yes we do!